Shane Black has revealed a sneak peek at what the Hell-Hounds in The Predator will look like from a new Funko Pop! figure. While the image is a little more on the cute side, it's easy to see that they have been redesigned to look more like their Predator masters. The Hell-Hounds were first introduced in 2010's Predators and were used by their masters to hunt human prey and drive them out of hiding spots. The idea of the Hell-Hounds was good in theory, but they were just placed in the wrong film. The Predator has been teasing DNA testing and hybrids, most famously with the Upgrade Predator, which has been shown in the trailers and promotional material. The film underwent extensive reshoots for about three weeks earlier this year and it's believed that some of the other hybrid creatures did not make the final cut, leaving the focus on the menacing Upgrade Predator. However, the Predator dogs, or Hell-Hounds, have made the cut and Shane Black shared an image of a Funko Pop! figure of the beast. Though Funko has a knack for making even the most ugly things look cute with their Pop! figures, the Hell-Hound from The Predator still manages to look pretty creepy, even in toy-form. Right away, it's noticeable that it resembles the Predators more, but with an even more messed up set of teeth. Seriously, somebody needs to get these things to a dentist and then an orthodontist to get this teeth situation straightened out. The poor Hell-Hound looks like he has way too many teeth for its small mouth. At least that's the way the Pop! figure looks. They'll probably be a lot more scary when the movie hits theaters. 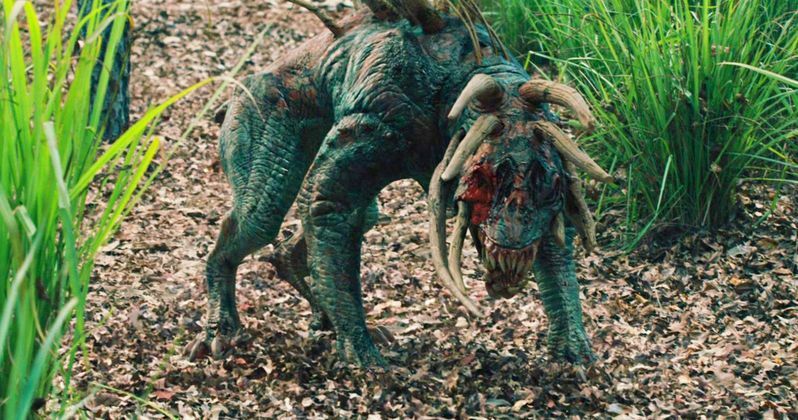 Now that Shane Black has shared an image of the Hell-Hound from The Predator, it could signal that we'll get to set our eyes on the real thing next week when San Diego Comic-Con takes place. Black will be on hand for The Predator panel and it has been rumored that we will get to see a little bit of some new footage, even though Black is highly against sharing too much of a movie before it is released in theaters. However, a slight tease with some Hell-Hounds could go a long way in boosting confidence for the movie. The Predator initially had too much comedy in it, according to reports from the test screenings, so Shane Black re-tooled it to give it more of a darker, horror element. The final scene originally took place during the day and the ending left test screen audiences confused, so it was totally reshot. Now that we know that some effort has been put into place to fix The Predator, excitement for the movie has gone up considerably. While we wait for more Comic-Con news, you can check out the Funko Pop! of the Hell-Hound below, thanks to Shane Black's Instagram account.